Make a point to check your messages before proceeding because news of a last minute development could change everything. Beggars can’t be choosers when it comes to eleventh hour saves, but this one should make you very happy. A taciturn type opens a floodgate of opinion. You may long for the antediluvian days when you were kept guessing, but now that you’re in the know you must proceed from here. The more that someone alludes to things he’s yet to produce, the safer it is to assume he hasn’t anything to show for himself. You thought a certain matter was behind you. Guess again. Take care of it promptly. Dragging your feet just isn’t worth the aggravation. A work situation is finally resolved. Superiors assume life will return to normal, but you and colleagues know better. There are changes afoot. Entangled circumstances do you a favor by ensnaring an offer all together. You’re working far too hard to make this fit into your schedule. Doing whatever it takes could wind up costing more than you’re willing to spend. Dip a toe in the water. No need to take the big plunge now. You prefer to solve problems swiftly but that won’t work this time however tackling it in stages works a different set of mental muscles. You can’t tell someone what to do, but there’s nothing wrong with laying a trail of breadcrumbs that leads to a solution you think best. 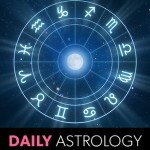 Mercury catches up to the Sun today bringing news or information that you requested weeks ago. Is it still useful? Better late than never. You don’t have to commit to everything right now. Time allows you to pick and choose. It’s rare when you get a luxury that you can afford.